I had a friend in high school whose name began with an “S”. This friend, as it may not surprise readers to find out, was more than a bit geeky and nerdy. His name was not Sherman, but my dad once admitted to often forgetting his real name and replacing it in his mind with Sherman. He was reminded of the character from the old The Rocky and Bullwinkle Show segment “Mr. Peabody’s Improbable History”. I never really cared much for that old show, and I don’t know if dad was actually a fan of it, or just found it unavoidable during his own childhood and adolescence. I doubt he’d admit to being a fan even if he was. That’s just the way my dad is. He is not, thank you very much, likely to be described as geeky or nerdy; so, his apparent remembrance of this show, and a strange fondness for the Vger twist from the first Star Trek movie are the only hints that there might be that side to his personality, so I was mildly excited about this movie for that reason, as well as the fact that Robert Minkoff, one of the co-directors of The Lion King, was helming it. But, at the end of the day, this movie was just okay. I don’t regret seeing it, but I don’t have any especial need to see it again. It’s just an okay movie; nothing more, nothing less. Mr. Peabody (Ty Burrell) is a genius dog, who, in order to show off his intelligence, has created a time machine known as the WABAC machine (in this version, it looks a lot like a red, futuristic egg; it actually looks a lot like the time machine from Free Birds). He has also adopted a boy, Sherman (Max Charles), arguing that as boys often adopt dogs, and he’s obviously the more responsible one here, why not flip the paradigm, as it were. On the first day at a new school, Sherman accidentally humiliates Penny (Ariel Winter) when he corrects her about George Washington chopping down a tree; seeing as how he’s met the guy, he knows it’s just a story. Penny bullies Sherman in the cafeteria, resulting in Sherman biting Penny, which has Protective Services called in, who never really believed a dog could raise a boy, anyway. However, Mr. Peabody decides he can best cool the situation by inviting Penny and her family to his penthouse; Sherman, in attempting to entertain Penny, lets slip the existence of the WABAC Machine, and before you know it, Penny’s engaged to King Tut. This being a time travel movie, time paradoxes follow shortly. Or precede shortly. It’s a time travel movie; sometimes it’s hard to keep track, you know? This is not where the problem lies, per se, but it is part of the problem. 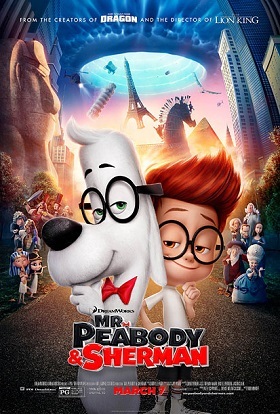 The characters themselves are funny, and Ty Burrell is well cast as the new Mr. Peabody. He’s a dead ringer for the original voice done for Mr. Peabody, by Bill Scott. Of course, Penny starts the story as a bully, but she’s not supposed to be likeable at the start. The problem is that the inciting incident for the plot, Penny bullying Sherman by calling him a dog, doesn’t make sense for the character. Penny points out that his adopted father is a dog; he seems like a guy who would laugh at that line of thought, happily agree to it, then continue eating his sandwich. Instead, the movie treats this as a significant source of angst for Sherman, despite the fact that “angst” and “Sherman” are two words that shouldn’t be in the same sentence. It becomes the “emotional core” of the movie, but the truth is, I’m not sure this movie needed one. They never needed one in the show; these characters are who they are, and they have fun adventures. The best part of the movie is the beginning when Mr. Peabody and Sherman visit the French Revolution; there are no emotional stakes here, but it’s still more exciting then the movie’s overblown climax where Sherman finally accepts his role as the son of a dog, despite the fact that he’s always accepted his role as the son of a dog. It is a definitive improvement over the original show’s. About a week after I saw this movie, I happened to overhear a small girl explain the plot of this movie; she obviously enjoyed it. She apparently didn’t find the idea of time travel that interesting, but the idea of a boy adopted by a dog just tickled her pink. In other words, almost the exact opposite of my take; perhaps the filmmakers were right to focus on the adoption part? Or maybe she was just a five year old. What do they know?